The STICK of the year! Stand alone wall mounted DMX controller. New 106x146mm glass design with touch-sensitive buttons, color/dimmer/speed palette and graphic color display. 2 DMX OUT universes (1024 channels). USB+ETHERNET connection. Multi-zone memory. Trigger from RS232, PORTS, infra red, clock/calendar. Works on PC/Windows with ESA, ESA2, ESA PRO and SUITE2 software. Works on MAC with ESA2 software only. 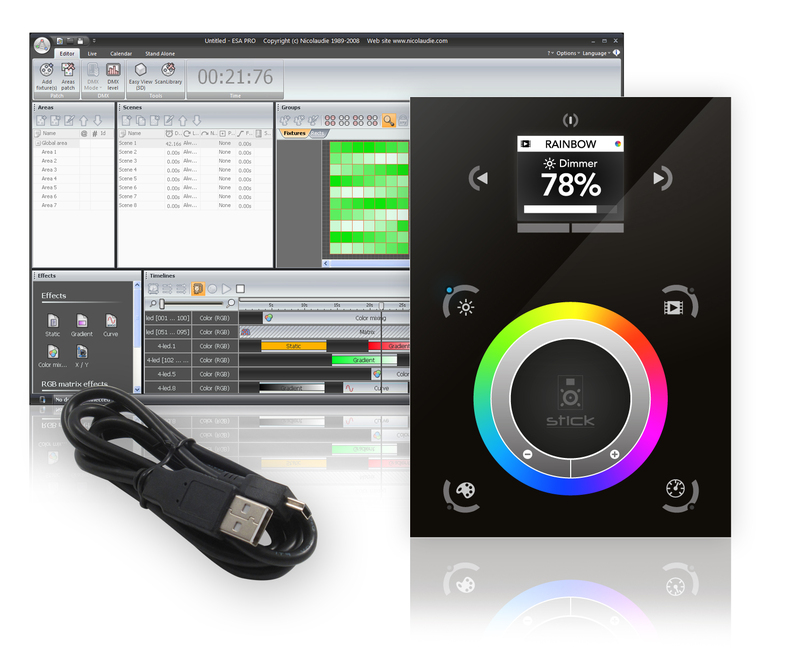 Works on iPhone/iPad/Android with ARCOLIS and STICK REMOTE applications. Delivered with a USB cable. CAUTION: 6V power supply and Infra red remote control are in option.